Beaver Camp Pool: Fun for All Ages! Swimming is and has always been a staple here at Beaver Summer Camp! 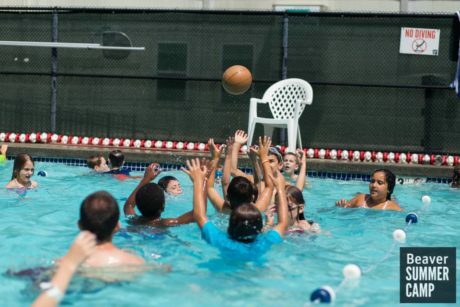 Lessons are offered to campers of all ages, but did you know we offer other swim opportunities? We took a few minutes this morning to talk with Pool Director Larry McKinney about the scope of the programs offered to campers at the Beaver Summer Camp pool. Lessons begin as early as age 3. The focus is on comfort in the water with our youngest lower campers, beginning in the baby pool with splashing, then move to the shallow teaching pool. Kids work 1-on-1 with a counselor or lifeguard, learning to develop confidence floating, putting their face under the water, using their hands and feet, or just being wet! 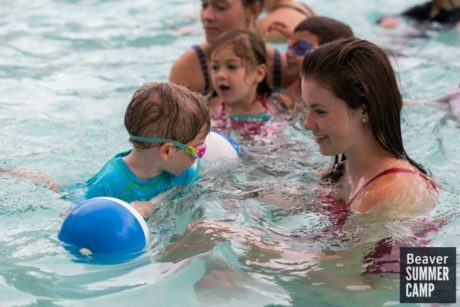 At ages 4 and 5, campers work in a class group with a few counselors and lifeguards focused on beginning stroke development, breathing, and jumping into the water. Middle camp is where students begin to work through the Red Cross swim levels. At the beginning of each session, campers are evaluated to assess their current skills and placed in a group with campers of similar ability. Learning strokes as well as water safety, kids have an opportunity to demonstrate their skills each week, and campers that pass earn a Red Cross swim level card! More advanced kids have options to work on their swimming skills beyond traditional lessons. Campers that have passed through swim level 4 can opt to work developing lifeguard training skills, such as water rescue techniques. Senior campers can select a swim team elective that focuses on stroke refinement and includes some competitive events! 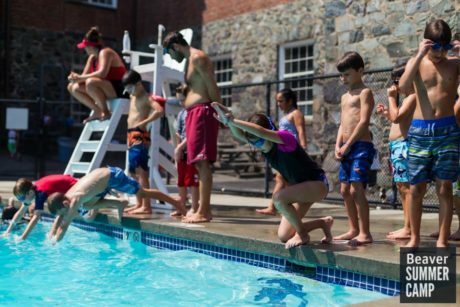 Free swim in the after noon allows all campers time to work on their skills, practice water safety, develop confidence, and just simply have fun with their friends! Here at Beaver we take fun seriously… but we also take safety very seriously! In addition to lifeguard training, many of the guards have also completed the Water Safety Instructor certification. Swim lesson groups are lead by a WSI lifeguard with at least one additional guard or counselor on hand.